You’d be tempted to try to detach the Gorilla Glass screen from the Rose Gold/Royal Blue/Quarts Gray aluminum chassis. We don’t blame you – at only 13mm thick, the ZenBook 3 looks very much like a tablet. This is not the case, however, as the display is neither a touchscreen, nor separable from the keyboard. Despite the modern look, Asus is providing a laptop and its use is as old-fashioned as they come. 100g shy of a kilo, this is surely one of the nicer laptops we’ve seen around and will be a pleasure to hold on your lap in an airport, as well as on a coffee table should it strike your fancy. The back-lit keyboard looks inviting with those large spaces between keys, but feels flimsy and cheap when pressed and in our expert opinion won’t last long if you’re an avid typer. 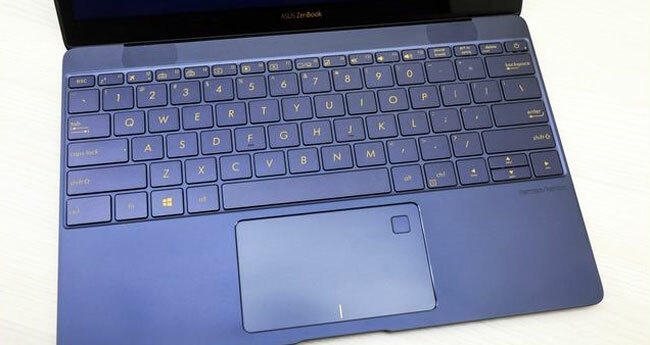 The trackpad is similarly faulty – a general click won’t do and you can forget about tapping to select. Asus has included a fingerprint sensor right on top of the trackpad, which we think is a very awkward design decision and will be annoying to the user in the long run. A USB-C port and a 3.5mm headphone jack, reminiscent of Apple’s design. Asus is more generous than its competitor though and offers you an USB-C adapter straight out of the box, which means that HDMI and USB-A are not completely out of the question. We definitely like the Core i7 that Asus included to beat the MacBook and we think it keep heavy users happy, while surprising others. 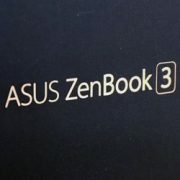 The downside is that the ZenBook 3 doesn’t have a dedicated GPU, so you can say goodbye to hardware-intensive gaming sessions or CAD design requiring a high level of detail. If you’re buying it for work in a creative industry, spare yourself some time and skip to the verdict: this one ain’t for you. Considering how thin the ZenBook 3 is, you’re bound not to expect a stellar continuous operating time. 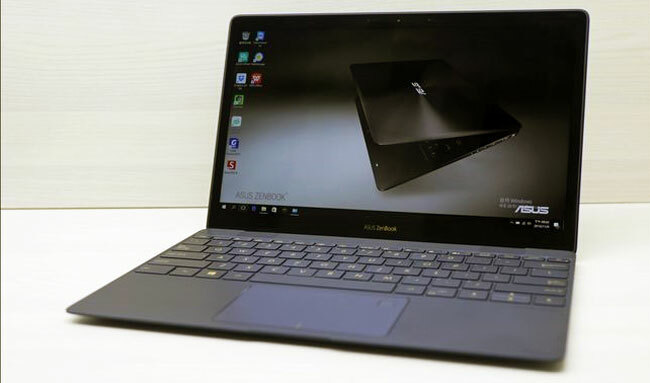 The performance in this respect is average at around 9 hours, with the MacBook Air and HP Spectre x360 outclassing the ZenBook 3 by at least 2 hours. It doesn’t get as hot as other models from other brands, so we have to give Asus a big thumbs up on that. The webcam is also nothing to be proud of as the VGA resolution is simply abysmal in this day and age. You’ll probably find it a pain to attempt any video calling on this one. With an average display, nothing special in terms of battery life and flimsy keyboard, we think the Asus ZenBook 3 is a no-go. …you’ll find yourself wondering what it would have been like to have a properly-designed laptop to show-off. The Asus ZenBook 3 did not impress us and we don’t like it. If you’re against buying an Apple for some reason or other, you’re still better off with a Razer Blade Stealth which gives you a touchscreen, or the flashier HP Spectre x360 which looks and feels amazing while also running Windows. If heating is your only factor though, pick the Asus, as this is where it truly excels. Is there someone who would be happy with this one though? Well, if you’re buying it for your grandma to read email on and bug you with cat videos while you’re out partying with your friends, then yes. It’s a pretty thing to boast at the elderly bingo night, although quite wasteful on the hardware for the purposes envisioned. This is unhappy Becky B. signing off from the Netherlands.